In the East Lake area go to Lansbrook Parkway and you will come to the charming neighborhood of Devonshire on your left. Step inside these properties and you will feel right at home. They have very attractive amenities such as wood cabinetry, newer appliances and granite countertops. In the family room you will find wood burning fireplaces, vaulted ceilings and lots of space for entertaining. The large master suites have Jacuzzi tubs in the bathroom, impressive walk in closets and plenty of privacy. Outside the screened lanai's, inviting swimming pools and meticulous landscaping give these homes great curb appeal. Built in the late 1990s, they range in size from 2400 sq. ft. up to 4000 sq. ft. Come see if these stunning homes are perfect for your family. In Lansbrook you will enjoy more of the outdoor Florida lifestyle than many other Palm Harbor neighborhoods. There are many walking and jogging trails, soccer fields, playground, a private park with boat launch and boat day slips, along with picnic facilities and restrooms. What a great place to live and raise a family. This is a perfect mid-range community in the heart of Lansbrook. We'd be happy to show you around the community as it is one of our favorites. 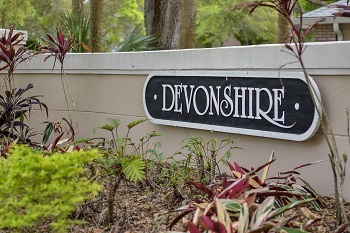 Selling your home in Devonshire at Lansbrook? Our experienced agents will have no trouble selling your home quickly in Devonshire at Landsbrook. We are confident we can assist you in making the most out of a possible sale of your home. Give us a call or fill out the contact form below to begin the process!